It didn’t take long for the UFC to locate a new opponent for Abel Trujillo. 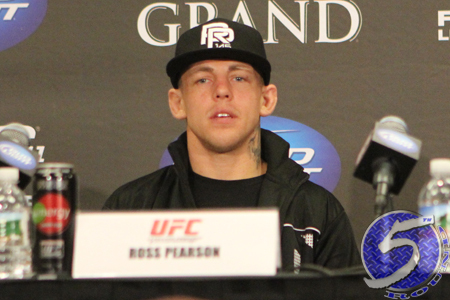 Just hours after announcing Bobby Green would face Josh Thomson at UFC on FOX 12 instead of Trujillo at UFC Fight Night 47, it was reported Ross Pearson (pictured) has agreed to meet Trujillo in the April 16 event. Pearson is looking to bounce back from last month’s highly controversial split decision defeat to Diego Sanchez. Nearly everyone with two eyes who saw the scrap, including UFC president Dana White, believed Pearson was robbed. Trujillo will be riding a two-fight winning streak into the tango, both coming via some form of knockout. He was most recently seen destroying Jamie Varner at UFC 169 in February. The lightweight affair will likely appear on the main card. Cross Insurance Center in Bangor, Maine hosts the festivities.